As more and more data continues to pour in about small businessesâ€™ adoption of social media, a few things are becoming crystal clear. The first is that no platform has truly set itself apart from another, despite which survey you look at and what type of small business you ask. Many would argue Facebook has, but others disagree. The second is that the adoption of social media platforms continue to grow, but at a disparate pace (i.e. sometimes fast, sometimes slow). Third, itâ€™s very obvious that small businesses are (still) very much in the â€œfeeling outâ€� stage when it comes to what works and what doesnâ€™t related to social media. Perceptions are constantly (and consistently) changing, value to the business differs and new platforms continue to sprout up each year. Itâ€™s no wonder small business owners are confused about where to start, how to make it work and most importantly, how to derive any revenue from it. So how do we come to any concrete conclusions about small business social media use? The answer is simple: we canâ€™t. Much like social media itself, within the small business community itâ€™s an ever changing ecosystem that has ebbs and flows no one can predict. Anyone banking on social becoming a benchmark of small business marketing in the next year plus â€“like traditional advertising, email marketing, direct mail, etc. â€“ is going to be sorely disappointed. Some new data, released last week by the Wall Street Journal, surveyed more than 800 small businesses, with revenues ranging from one million to $20 million. Most people are taking a look at the high level results, citing that LinkedIn is leading the way in terms of success for small businesses, while Twitter is lagging behind. According to the data, LinkedIn was used most frequently by small businesses at 30%, and was viewed as having the most potential for helping a firm, at 40%. Facebook was frequently used 22%, while 14% of small businesses cited it as having the highest potential. 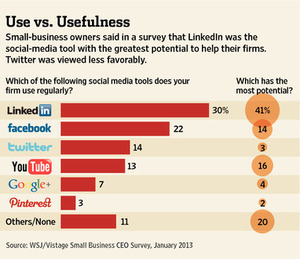 But what isnâ€™t shown in the graphic included in this post is what social platform was second in terms of potential. Know what it was? Nothing. Thatâ€™s right, 17% cited â€œnoneâ€� as having the second most potential for helping their businesses. That was higher than Twitter (3.3%), YouTube (16.62%), Facebook (14.21%), Google+ and Pinterest (both in the single digits). In looking at this data, it furthers a theory that I had a few months back that while small businesses continue to â€œflirtâ€� with social media, few are truly adopting it as a viable marketing channel and leveraging its full potential. There are a few reasons for that. One is that even big companies havenâ€™t yet fully figured out how to monetize and effectively use social channels over long periods of time (with some notable exceptions). If they havenâ€™t mastered it, how can small businesses be expected to? Second, time continues to be the biggest form of currency for any small business owner, and itâ€™s not one theyâ€™re willing to spend on social media â€“ a largely unproven method of marketing. Finally, the education and knowledge of social channels among most small business leaders and owners is sorely lacking. Twitter admits to as much within the WSJ piece, with vice president of global online sales Richard Alfonsi saying Twitter needs to do more to educate small businesses on the benefits of using its service on the most effective ways to use the service.Â Facebook has made overtures to small businesses as well, with mixed results. Will small businesses eventually find their â€œwheelhouseâ€� social media channel(s) and use it to their advantage? I have no doubt, at some point in the future. Social is here to stay and small business owners need to properly vet which makes sense for them. But anyone shocked or surprised that the majority arenâ€™t yet seeing the â€œbang for the time invested,â€� shouldnâ€™t be. Itâ€™s going to be a few years before social becomes the â€œnormâ€� in any small business marketing operation, at least in terms of driving dollars and value. Has your small business effectively used social media in the past year? Have you found it to be time well spent?